Moraine Lake is a glacially-fed lake in Banff National Park, 14 kilometres outside the Village of Lake Louise, Alberta, Canada. It is situated in the Valley of the Ten Peaks, at an elevation of approximately 6,183 feet. 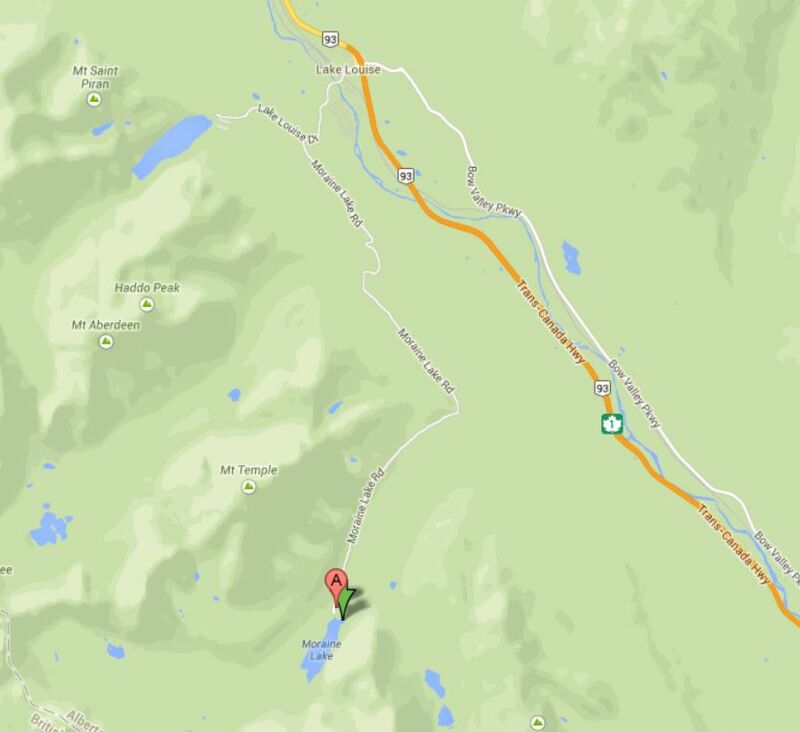 Download free directions, maps, GPS and photo advice for Moraine Lake by selecting the Maps and Directions tab above. Moraine Lake is only half the size of its nearby neighbor Lake Louise, but perhaps even more scenic. 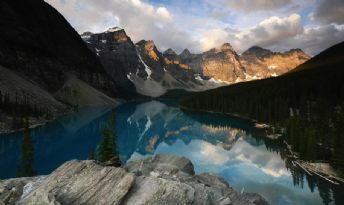 It’s a glacier-fed lake situated in the beautiful Valley of the Ten Peaks in Banff National Park. At the high elevation of 1883 meters, it remains frozen into the month of June and does not reach its crest until mid to late June. Once the glacier water starts to run, it brings with it rock, flour, or silt. This is what the light reflects off to give the lake its stunning deep blue color. This location requires minimal route exploration. The area this photo was taken from is marked on the downloadable map. Select the green “View Map” tab to view this location on Google maps. Enter your starting point for detailed driving directions. From the parking area there will be paved trail that leads to this vantage point. Download a free copy of the Four Factors of Filter Highlight Photography in PDF format by selecting the “ebook download” tab above. This 37 page guide covers how to take a single image and apply minor manipulations that will help you produce consistent reproducible results. You will also learn the processes of camera set-up, image editing, and advance scouting techniques used by professional photographer Christian James. Free park maps, tide reports, ebooks and additional information can be found under the Maps and Resource tab located in the black bar at the top of the screen. Recommended Accommodations: Fairmont Chateau Lake Louise (Most Luxurious and Restaurants), Moraine Lake Lodge (Privacy), Deer Lodge (Fire Place and Affordable), Lake Louise Inn (Most Affordable and Night Life), Lake Louise Campground (Clean/Free Firewood/Clean Showers), Overflow Campground (No Reservations 2 Miles East of Lake Louise $10 Per Night) Over the years I have stayed at all the recommended accommodations and placed why I enjoyed each in parentheses. The best time to photograph this locations is sunrise. Nikon D3x 14-24mm Lens @ 17mm f16@ 1/5 second ISO 50 Exposure Value -1.0 with a 3 Stop (0.9) Soft-Step Spilt ND Filter. 8/1/13 5:07 a.m.